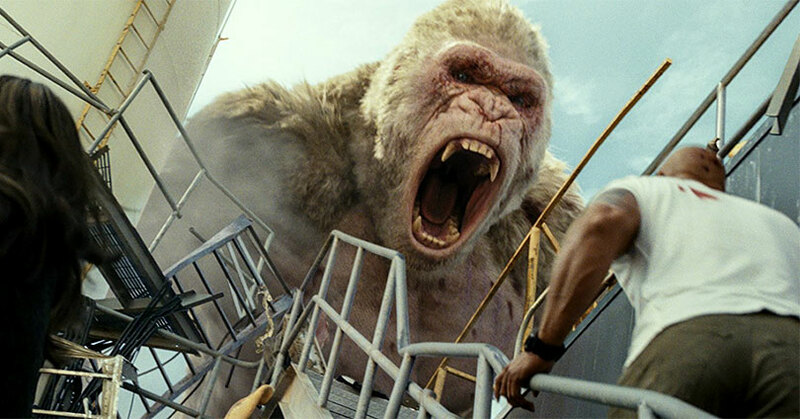 Rampage was going to be the film that defied the video game curse and actually be a good movie. 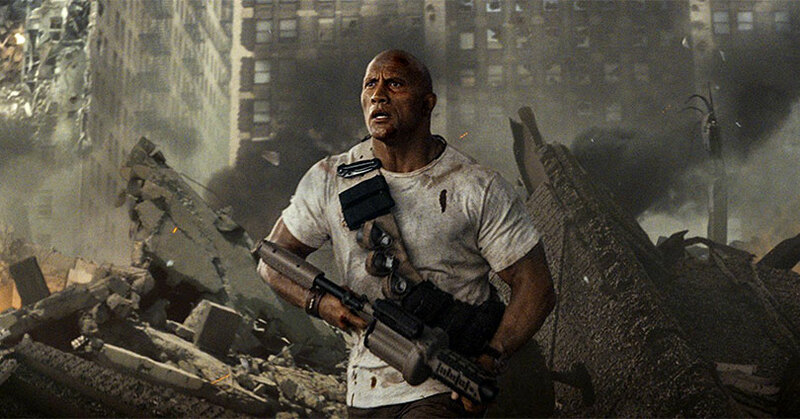 Unfortunately, Rampage continues the trend of mediocre video game movies. The biggest problem with the movie is the dull setup towards the satisfying monster mayhem in the third act. The movie has quite a lot of useless scenes and characters that bog down the movie. Instead of letting audiences care about the characters, they disappear soon after their introduction. In addition, the storyline is incredibly hokey. Sure, it’s a video game movie but the film’s tone is a bit too serious. While other hokey movies embrace its ridiculousness, Rampage is a bit too realistic. Not to mention, the dialogue in the film is just as cheesy. But what Rampage gets right is in the way it gets you to care about George. Much like the Planet of the Apes reboot, we attach ourselves more to the apes than we do the human characters. Primarily because George has more of a personality than anyone else in the film. Plus, George is the type of character that you wish you were friends with. Unfortunately, the rest of the characters are all one-dimensional without any sort of character arc for any of them. Despite all that, Dwayne Johnson does whatever he can to bring some fun to the film. With the delivery of his cheesy lines and through his charisma, Johnson carries the film on his broad shoulders. The only problem is that even against giant monsters, he never seems to act hurt. He actually acts scared, for once, but he never acts hurt. 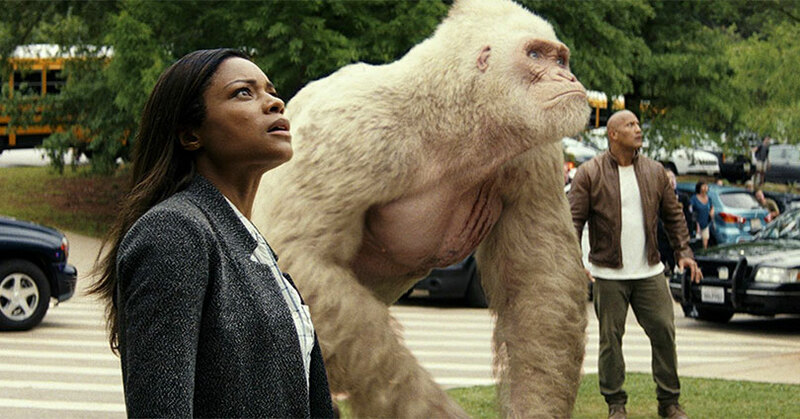 Poor Naomie Harris, though. She follows up her Oscar-nominated role with a role where she simply provides exposition and advances the story. It’s clear that she doesn’t give a hundred percent to it. Jeffrey Dean Morgan hams it big time with his “cowboy” character. He does provide a bit of fun to the film. Overall, Rampage is a big goofy film with a ridiculously outrageous storyline. Nevertheless, the monster mayhem is still a lot of fun to watch. There’s just something entertaining about seeing monsters wreck cities. Rampage hits 4K Ultra HD with a Dolby Vision/HDR10 4K transfer and a 2.35:1 aspect ratio. Essentially, there’s a minor difference between the Ultra HD and 1080p Blu-ray. Nevertheless, the biggest difference is in the brightness of the video. The regular 1080p Blu-ray noticeably brighter than its Ultra HD counterpart. As a result, there is some slight bloom in the incredibly bright areas. Not to mention, the sharpness is a little high on the 1080p Blu-ray. Thankfully, the HDR fixes all of these problems. The whites stay bright without any blooming or loss of detail in the bright areas. In addition, you won’t find any oversharpening on the Ultra HD Blu-ray. Instead, there’s a slight softening of the edges. Not surprising since the source video is upscaled to 4K. Nevertheless, the details and film grain are still really clear. Even the smallest of details can be seen here. The black levels are nice and dark but you will find some minor crushing in the shadow detail. The colors look natural without any oversaturation. Overall, this is a great video presentation. Rampage hits 4K Ultra HD with a Dolby Atmos and a core 7.1 Dolby TrueHD track. The review will reflect Rampage‘s core 7.1 Dolby TrueHD Master Audio track. For a film full of mayhem and carnage, the audio mix is as chaotic as you might expect. There is a bare minimum of sound effects that occur during the film’s most chaotic scenes. Be that as it may, the audio mix is still an immersive experience. The sound effects and score fill up the soundstage putting you right into the chaos. Thankfully, none of them overpower each other. The same goes for the LFE as well. The LFE complements the audio mix nicely which gives the overall mix some weight. In addition, the dynamic pans are quite impressive as the sound effects seamlessly move around the entire soundstage. Despite the loud activity within the soundstage, the dialogue can still clearly be heard. Despite the lack of audio mayhem, this is still a crisp, loud, and immersive audio presentation. Even though a majority of the featurettes are typical EPK stuff, they’re still insightful pieces. “Bringing George to Life” is easily the most intriguing of them all. It’s here that we get to see the incredible Terry Notary provide an inside look into becoming an ape. Not to mention, we get to see the motion capture process of becoming an ape. Now, “Attack on Chicago” may sound like a throwaway featurette but it’s actually a very informational piece. The techniques WETA and Brad Peyton used to create the climactic Chicago scenes are truly remarkable. It’s not as simple as you might think. The rest of the featurettes are worth the watch but they’re not as memorable as the others. Finally, the gag reel is partially funny and the deleted scenes are all a waste of time. There are some deleted scenes that also repeats with only minor differences. 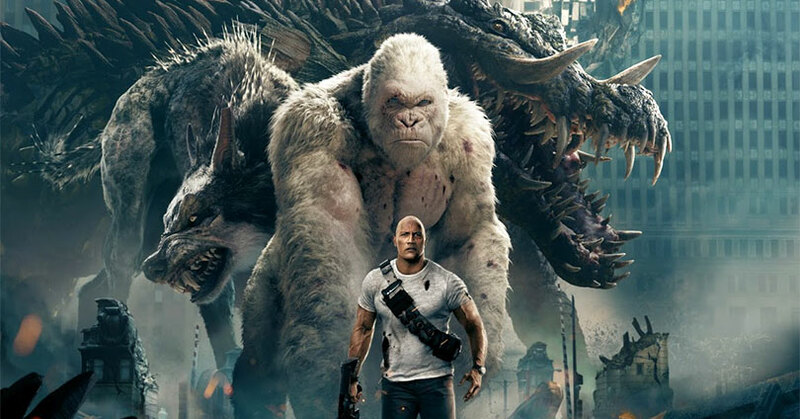 Overall, Rampage continues the trend of mediocre video game movies. Regardless, Rampage is a step in the right direction for the genre. The filmmakers care about the source material which is what all adaptations need. The video and audio presentations are all excellent. The special features are all insightful pieces despite the dull gag reel and deleted scenes. The post Rampage – 4K Ultra HD Blu-ray Review appeared first on Nerd Reactor.